As I recounted in my biography of James Tissot (1836–1902), within days of his lover’s death in late 1882, he returned to Paris, and soon embarked on painting a series of large canvases on The Woman of Paris. By 1885, though, he had changed direction again, and for most of the remaining years of his career he painted – almost obsessively – scenes from the Bible, starting with more than 350 gouache paintings of the life of Jesus Christ. This may seem an extraordinary choice for a fashionable painter who had spent much of his career amid what Judith Dolkart has called “the champagne intrigues and innuendo of his usual worldly fare”. I think that is perhaps a rather narrow view of his previous work, as I reviewed in my account of his early narrative paintings, but it certainly was a big change, and unforeseen. Tissot had already shown signs of returning to more moralistic narrative paintings in 1882, before Kathleen Newton’s death. Most obvious was revisiting the parable of the prodigal son – which he had previously painted in 1862 – in a series of four major oil paintings, which he then put at the centre of a one-man exhibition. 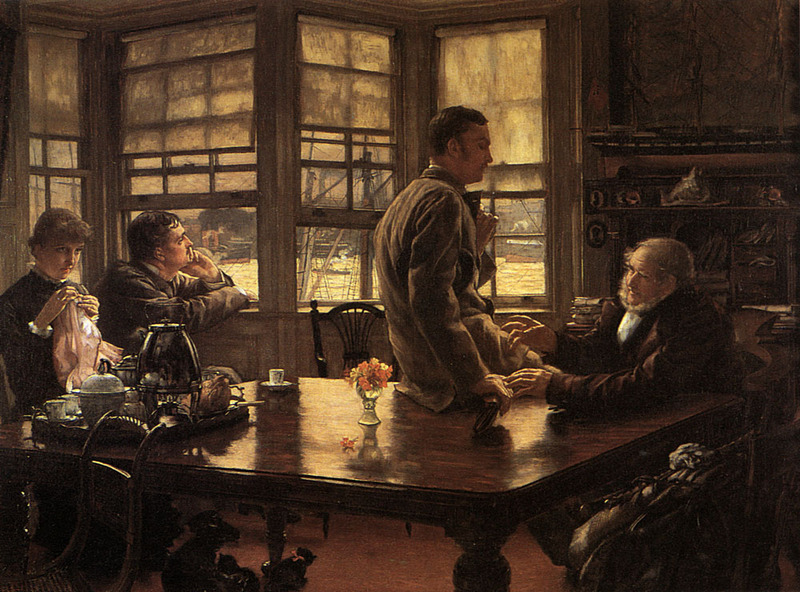 James Tissot (1836-1902), The Prodigal Son in Modern Life: The Departure (1881-2), oil on canvas, 100 x 130 cm, Musée des Beaux-Arts, Nantes, France. Wikimedia Commons. Even clearer signs came towards the end of his new series, The Woman of Paris. The earlier paintings had lived up to his London reputation, but as he reached the final canvas, the greasepaint and grins vanished. James Tissot (1836–1902), Inward Voices (The Ruins) (1884-5), oil on canvas, 214 x 124 cm, The State Hermitage Museum, Saint Petersburg. Wikimedia Commons. Dolkart writes that Tissot was researching for the last painting in that series, Inward Voices (The Ruins) (1884-5), in the Church of Saint-Sulpice, Paris, which has some superb murals painted in 1855-61 by Eugène Delacroix. Tissot found himself drawn into taking part in a service being held at the time, and reportedly experienced a religious vision. 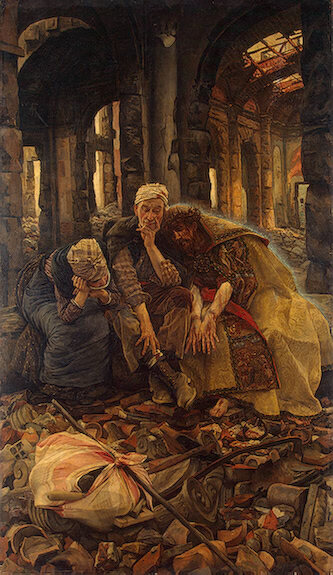 Inward Voices (The Ruins) is Tissot’s painting of that vision, a destitute couple sat amid ruins, the crucified Christ with them. The painting, although usually dated to the following year, was shown at the 1894 Salon (or Exposition) du Champ-de-Mars of the Société Nationale des Beaux-Arts, which opened a fortnight after the official Paris Salon (of the Société des artistes français). From the outset, Tissot saw his mission as educational as well as spiritual. He went to great lengths to try to ascertain the actual lay of the land of the main holy sites, which he was to paint, and to compile drawings of ‘representative’ facial appearance and dress. It may seem absurd today for an artist to visit locations almost two millenia later and expect them to have changed little, but Tissot was not the only painter to do this – William Holman Hunt, Jean-Léon Gérôme, and others, had done just the same earlier. He therefore visited Egypt, Syria, and what was then Palestine in 1886-7, and again in 1889, sketching, drawing, making extensive notes, and taking photographs. In some respects this fieldwork was valuable, but it also lured him to believe in the authenticity of what he saw. Many of his pen and ink drawings were used to illustrate his books, and must have been a great relief to the publishers, at a time when colour printing was difficult and costly. 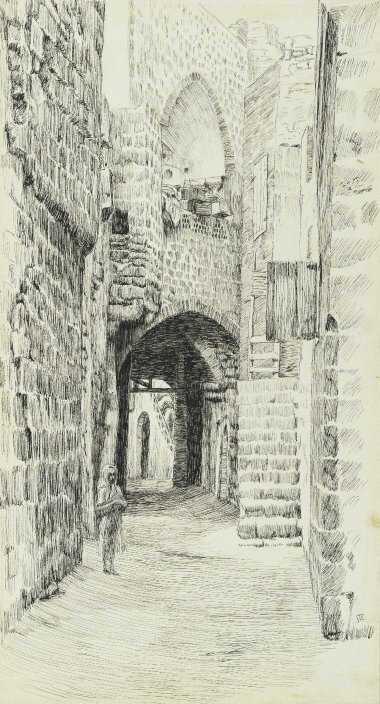 James Tissot (1836–1902), A Street in Jaffa (1886-1896), pen and ink mounted on board, 21 × 11.4 cm, Brooklyn Museum, New York, NY. Courtesy of Brooklyn Museum, via Wikimedia Commons. 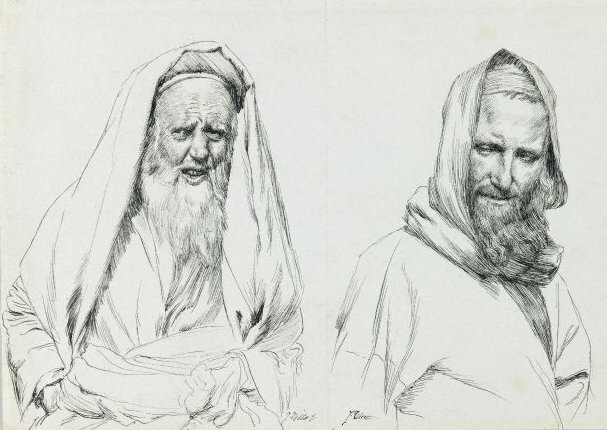 James Tissot (1836–1902), Types of Jews (1886-1889), ink on paper mounted on board, 12.1 × 18.1 cm, Brooklyn Museum, New York, NY. Courtesy of Brooklyn Museum, via Wikimedia Commons. 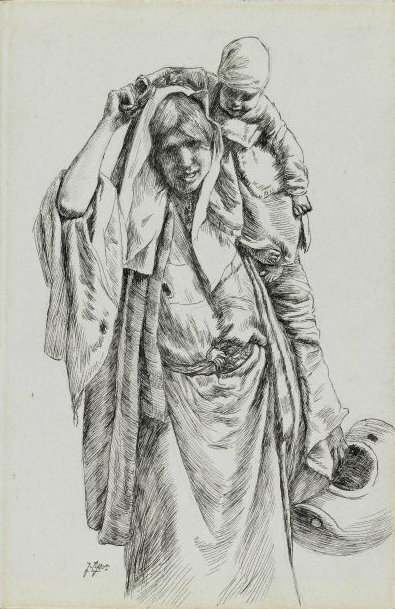 James Tissot (1836–1902), A Typical Woman of Jerusalem (1886-1889), pen and ink on paper mounted on board, 18.1 × 10.8 cm, Brooklyn Museum, New York, NY. Courtesy of Brooklyn Museum, via Wikimedia Commons. He did at one time think seriously of setting up a proper studio out in Palestine, but probably realised that it would only have created more problems. When he was back in his family mansion, the Château de Buillon, in France, he apparently led a pious life, praying at a local convent first thing each day, then drawing and painting through the day, before spending the evening alone, reading and in contemplation. Some attempted to catch him out, ogling women for instance, but by the prevailing standards of Paris life at the time, his conduct was monastic. For me, the greatest uncertainty is whether Tissot saw himself illustrating textual narrative, or creating narrative paintings. Without a clear statement of his intent, the evidence is ambivalent. What he produced was a set of more than 350 paintings showing scenes from the life of Jesus Christ, as recounted in the Gospels. What they were turned into was two volumes of parallel Latin (Vulgate) and French/English quotations from the Gospels, together with reproductions of his paintings and drawings. 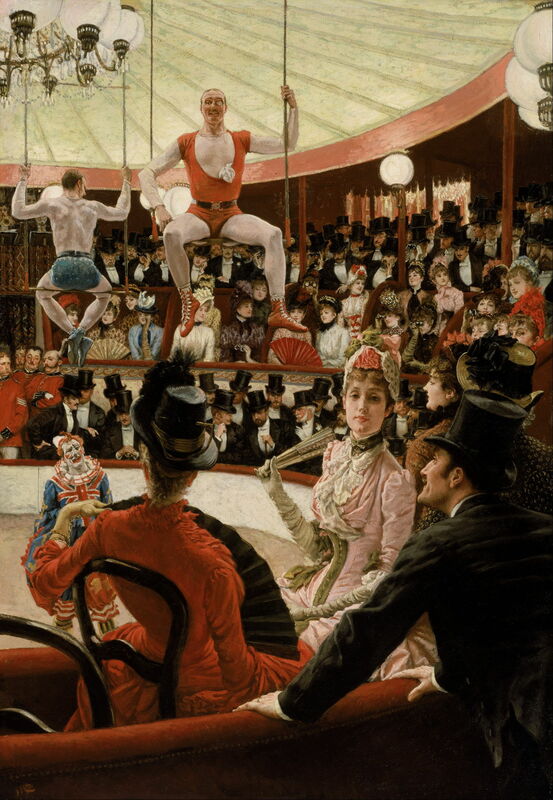 There are also various informative passages explaining Tissot’s drawings, experiences, and providing additional detail about locations, buildings, and events in the written narrative. 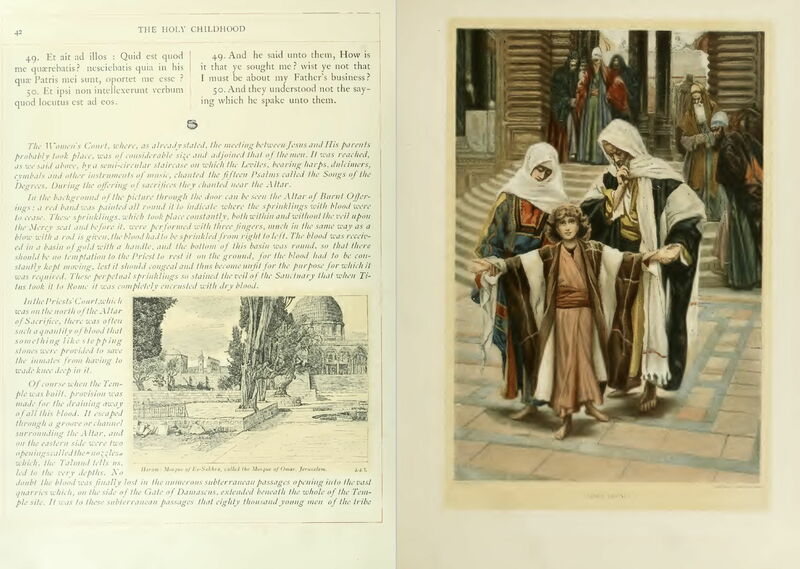 This spread from an English version of Tissot’s The Life of Our Lord Jesus Christ (1899) gives a good idea as to how his drawings and paintings were used, alongside the text. The medium which he chose, opaque watercolour or gouache, is more usually associated with illustration, although it has been used extensively in paintings intended to be fine art, and to stand alone without any supporting text. Given his workload, it was probably the only medium in which he was likely to have achieved his goal. His painting style is not obviously that of book illustration. For example, figures and objects are not drawn in outline using a dark colour, then painted in using flatter colour, leaving the outline. His technique, of sketching in with graphite first, then painting on top without dark outlines, is more painterly. Looking at his paintings, though, some have no narrative traits at all, suggesting that they were either tableaux within the overall series, or that the accompanying text told their story. James Tissot (1836–1902), The Lord’s Prayer (1886-1894), opaque watercolor over graphite on gray wove paper, 21.6 × 16.4 cm, Brooklyn Museum, New York, NY. Courtesy of Brooklyn Museum, via Wikimedia Commons. 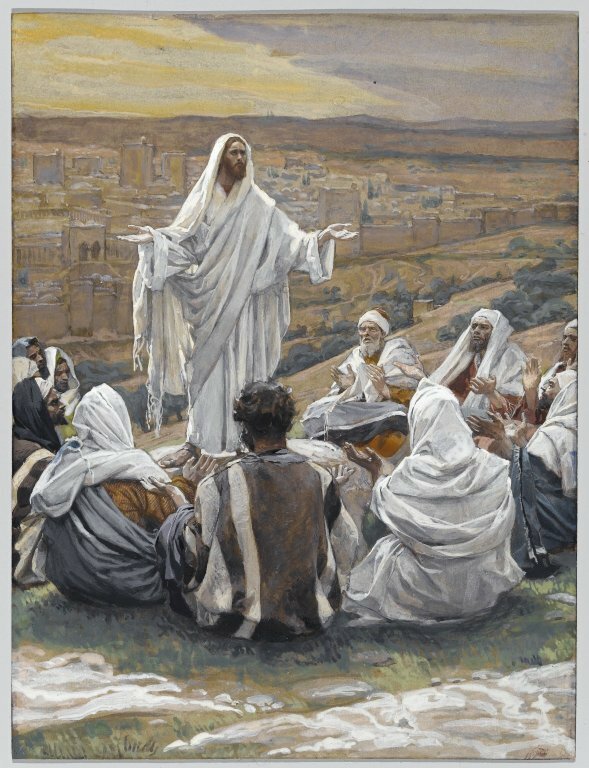 The Lord’s Prayer is a very challenging theme for any narrative painting, and Tissot chose an almost generic image of Christ teaching his disciples. He shows a moment in the story, with no clues as to preceding events, and none to the future. Neither can we gain any idea of what Christ is saying, except by reading the text. 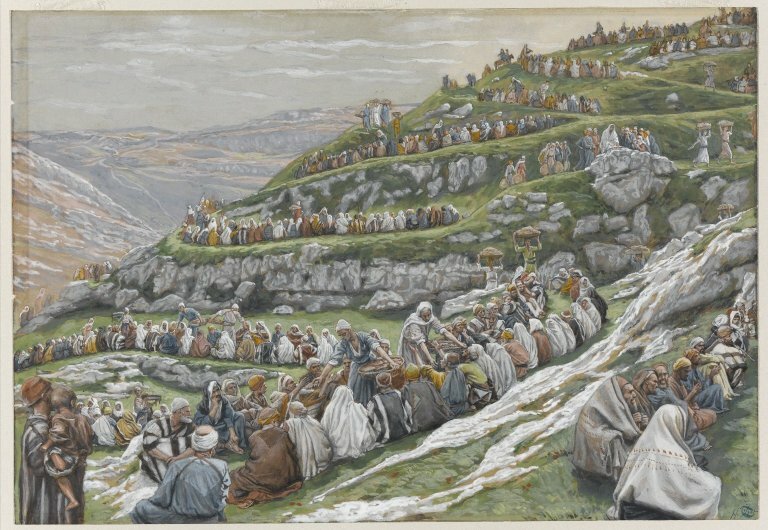 James Tissot (1836–1902), The Miracle of the Loaves and Fishes (1886-1894), opaque watercolor over graphite on gray wove paper, 18.7 × 26.8 cm, Brooklyn Museum, New York, NY. Courtesy of Brooklyn Museum, via Wikimedia Commons. The Miracle of the Loaves and Fishes is a wonderful, but entirely non-narrative, painting. The story of this miracle is not alluded to in any way, for which you must read the text. 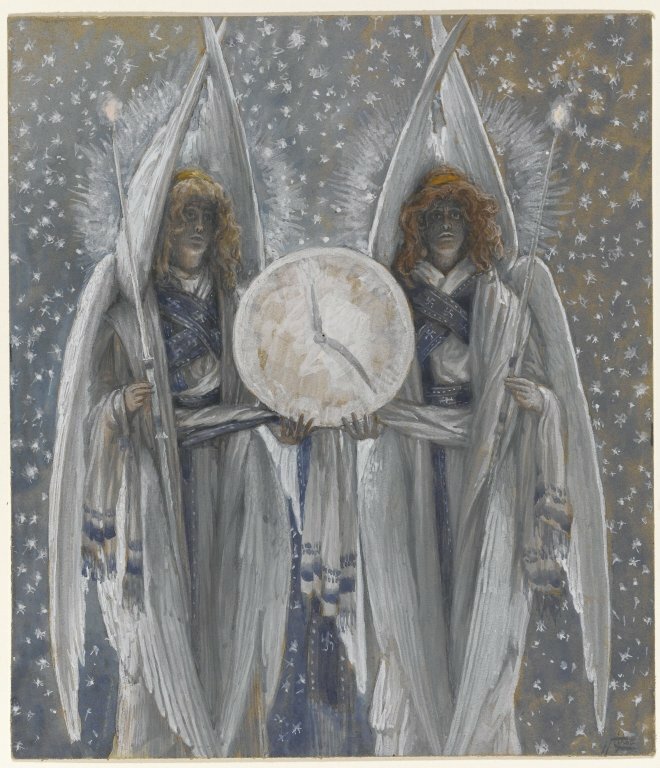 James Tissot (1836–1902), Angels Holding a Dial Indicating the Different Hours of the Acts of the Passion (1886-1894), opaque watercolor over graphite on gray wove paper, 19.7 × 17.1 cm, Brooklyn Museum, New York, NY. Courtesy of Brooklyn Museum, via Wikimedia Commons. Angels Holding a Dial Indicating the Different Hours of the Acts of the Passion is probably reliant not on the Biblical text even, but on Tissot’s explanatory notes. Its modern equivalent might be the ‘infographic’, perhaps. Other paintings, while not being narrative in themselves, do not appear to relate to any text narrative either. 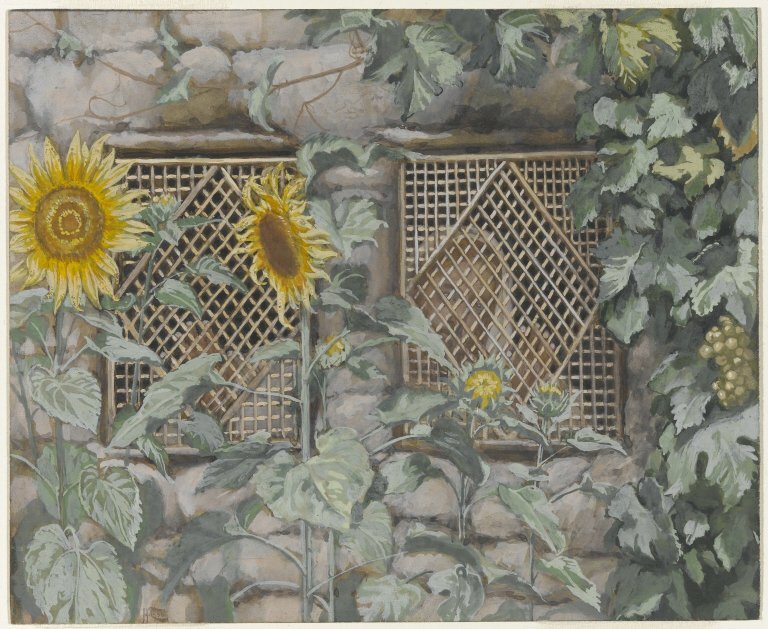 James Tissot (1836–1902), Jesus Looking through a Lattice (1886-1894), opaque watercolor over graphite on gray wove paper, 14.4 × 17.6 cm, Brooklyn Museum, New York, NY. Courtesy of Brooklyn Museum, via Wikimedia Commons. Jesus Looking through a Lattice appears to have been intended as some form of frontispiece, and was used as that in the book. But there are also many paintings which – to my mind, at least – succeed as works of art, and in many cases are inherently narrative too. 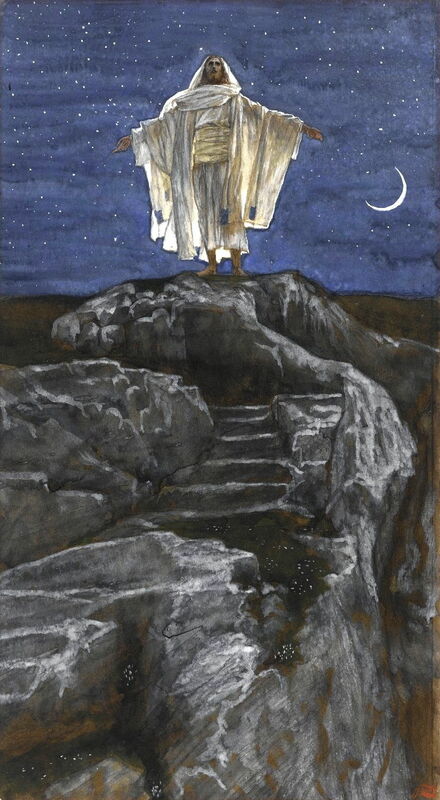 Jesus Goes Up Alone onto a Mountain to Pray is one of the most successful in the series, with its dramatic composition and lighting. What Our Lord Saw from the Cross is a uniquely innovative and narrative depiction of the crucifixion. 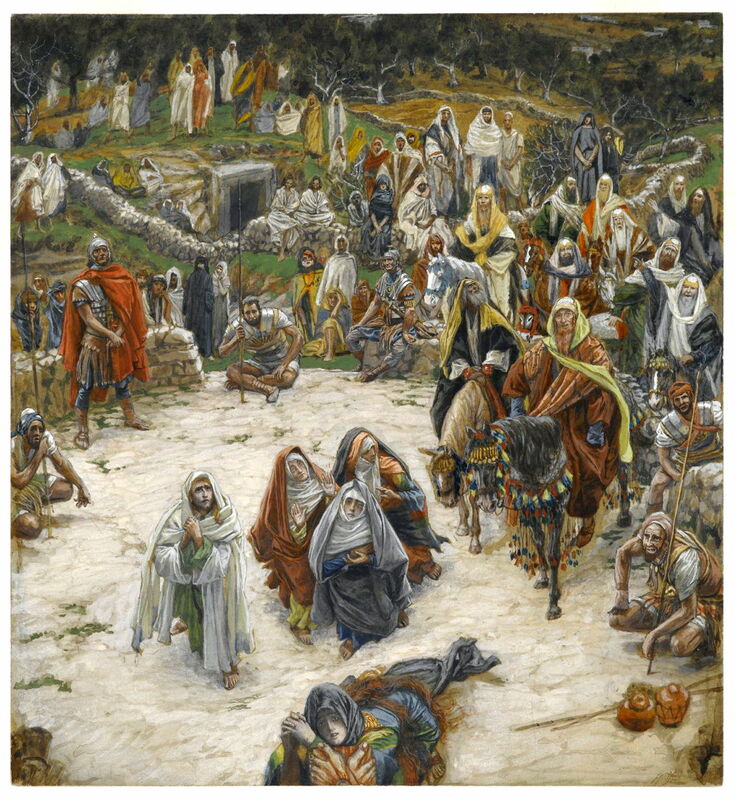 The more that I look at this remarkable series of paintings (and Tissot’s subsequent paintings of Old Testament stories), the more varied they appear. However, put together as a series, the whole is inevitably narrative art. In the next article I will look more at some of Tissot’s paintings from this series. Posted in General, Painting and tagged Delacroix, Gérôme, Hunt, narrative, painting, Tissot. Bookmark the permalink.